When cooler weather arrives in Florida, Renningers in Mt. Dora is always my first, favorite Fall outing. I attended Day #1 of their November Extravaganza yesterday and within an hour spotted and purchased this amazing sad iron heater! I’ve had a small, one burner Taylor & Boggs sad iron heater for years but always hoped to add a larger laundry stove to my collection. Until now I’ve only seen stoves offered in online or out-of-state Auctions, where shipping would add a hefty surcharge. I could hardly believe my eyes when I saw this stove! It’s a beauty, in near mint condition, complete with wicks and mica windows. The bottom of the stove is the liquid fuel tank, accessed via a small screw cap. The center of the casting has a hinged door that opens to reveal the burners. Only one of the mica windows is punctured. On the very top is the detachable metal slide access for holding three sadirons. 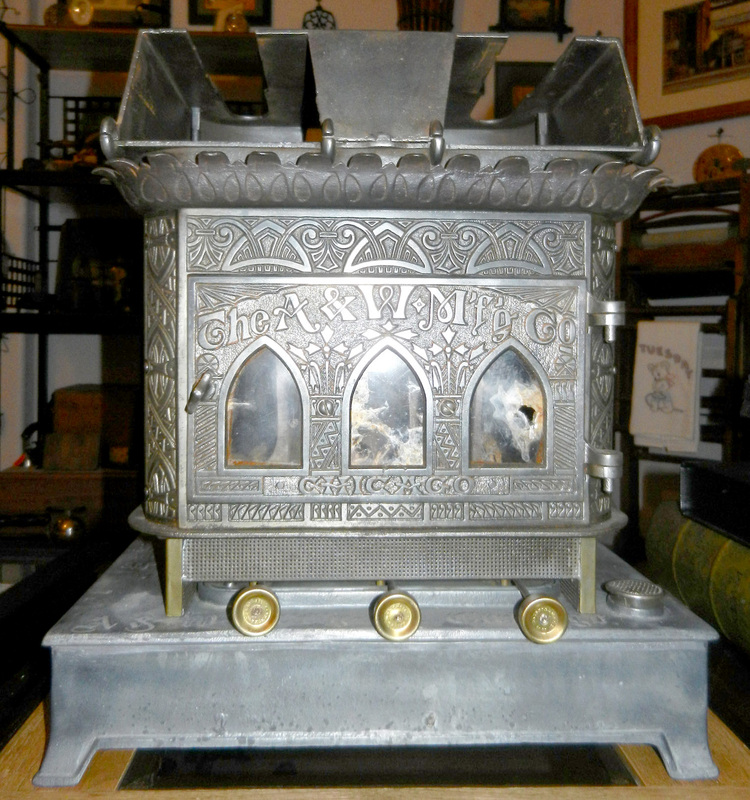 As you can see, this stove is as beautiful as it is functional, declaring this to be Model No.3, dated 1883, a product of the A & W MFG CO CHICAGO. On the side of the stove is a plaque that identifies the original patent date as 1869. Also, on the top of the base tank is a list of various production dates from 1869 through 1883. The purchase price was $325. The seller didn’t accept credit or a bank check, so I had to leave a deposit, walk about a 3/4 of a mile to the office/ATM and back … pay, then load it into my cart. The hardest part was pushing that heavy stove (plus 21 more pounds = the three 7 pound sadirons that came with it!) back up the sandy hill to the pasture, which serves as the gigantic parking lot for Renningers. And I made it without having my cart break down on the way to the car. Now that’s a successful day! Update: This handsome stove was sold for $300 to a fellow collector at our August 2016 PITCA Convention in Columbus, Ohio. Also, here’s 1869 patent information for the kerosene-stove portion of the sad iron heater. This entry was posted on November 19, 2011 by Lynn Rosack in Go-Withs, Other Metalware and tagged A & W Mfg. Co. Chicago, cast iron, Renningers, sad iron heater.